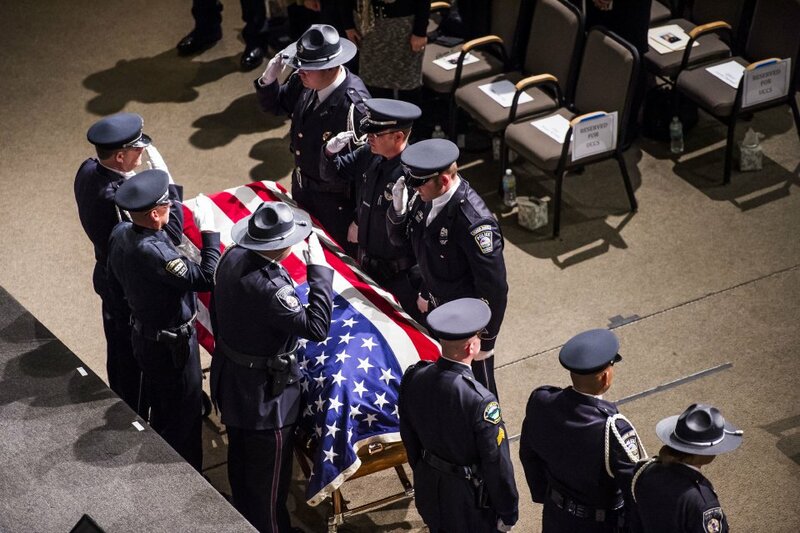 The Colorado Springs Honor Guard salutes the casket of Garrett Swasey, the University of Colorado at Colorado Springs police officer who was killed Nov. 27, 2015. Gazette file photo. University of Colorado at Colorado Springs police are doing “OK” after joining Monday night’s procession of first responders escorting the body of a slain El Paso County sheriff’s deputy to the county Coroner’s Office, said UCCS spokesman Tom Hutton. The last law enforcement officer killed in the line of duty in Colorado Springs was UCCS Officer Garrett Swasey, shot during a standoff at the local Planned Parenthood clinic two years ago. “So the Deputy Flick shooting is hitting close to home,” Hutton said. Deputy Micah Flick was killed by an as-yet-unidentified gunman Monday, while investigating an auto theft case at an apartment complex near Murray Boulevard and Galley Road. UCCS Police also offered to take calls for city police Monday night in the campus area, Hutton said, so city patrol officers could participate in the motorcade, which started about 7:30 p.m. Monday. “They’ll continue to offer their support,” Hutton said of university police, several of whom previously worked for the county Sheriff’s Office. UCCS Chief of Police Marc Pino is helping his 19 sworn officers in the grieving process, Hutton said. Swasey, 44 at the time of his death in November 2015, had worked for the UCCS police department for six years and responded to the initial reports of an active shooter. He was a co-pastor at a local church and an ice-skating champion. Reached by phone Tuesday, his widow, Rachel, declined to comment on Monday’s shooting or speak of her family’s journey since the loss of her husband and father of their two children. An online memorial fundraising drive for Swasey brought in $252,990, far surpassing the goal of $150,000.